This soundproofing article follows the Soundproofing Basics article and is intended to give a step by step instruction on how to soundproof a home, hotel, condo or office that is under new construction. In our Soundproofing Walls & Ceiling article we address retrofit soundproofing for existing floors, walls and ceilings. [As with all the articles in our Soundproofing Series, this is a practical, short and concise overview. For more in depth understanding of the science behind sound control, please browse our Understanding Soundproofing articles on the main menu]. Being that the sub floors are put down as part of the framing we will begin with soundproofing the floors. The Challenge: Aside for airborne sound coming through the ceiling, soundproofing floors face an additional challenge called Impact Noise (e.g. footsteps or an object being dropped, see Figure #1 below). Impact Noise is very difficult to control since the impact actually shakes the entire structure, creating vibrations. Labs often test Impact Noise, called IIC (Impact Insulation Class), however they use a tapping machine which does not compare to heavy footsteps or items being dropped. This lowers the accuracy and reliability of the test results and your structure may not perform well in actual life conditions. To counter this problem, there are many Floor Underlayment products being sold on the soundproofing market, some at very steep prices, with varying degrees of effectiveness. We cannot claim that we have tested every one of them; however, judging by the amount of customers calling us complaining about the inadequacy of their existing floor systems and the positive feedback we receive after offering our soundproofing advice, we are certain that the products we recommend and offer are unsurpassed. As a plus, our systems can be purchased at a fraction of the higher end product costs. The Solution: Due to the complexity involved in soundproofing floors, we try to utilize as many techniques as we can in the system. Therefore, we will start with the most effective system and also mention an option of a lesser degree, for those who are on a budget. A) Start by applying Joist Gasket Tape on each of the floor joists. This closed cell tape will decrease footfall and impact noise and some airborne noise. Additionally this will eliminate future floor squeaks which occur from the sub floor rubbing against the floor joists. B) Above your Joist Gasket Tape and Joists, install your sub floor and apply Green Glue Noiseproofing Compound onto it, using two tubes for every 4” x 8” sheet. C) Add a 2nd layer of Subfloor perpendicular to the first layer sandwiching the Green Glue in between. Screw down the 2nd layer to the floor joist as you would to a typical subfloor. D) (Optional: For greater footfall sound control, lay down Rubber Underlayment before applying finished floor). Tip: Installing the above steps before framing your walls will give you the best results as this will prevent sound seepage through the wall framing and will give you one continuous sound barrier with no breaks. 2) (Caulking: If you installed the 2nd layer once your walls were frames; Caulk the perimeter of the room with a high quality Acoustical Caulk to ensure a proper seal). 3) Apply Floor Covering: Install your floor as you would above any sub floor. If you are applying carpet, we recommend installing the thickest Carpet Underlayment possible. (You can go all out and use a premium carpet underlayment). 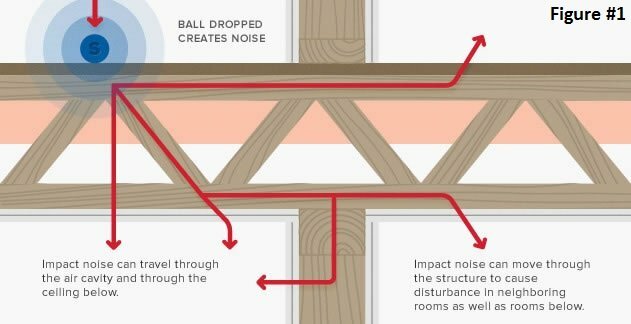 Even with your walls and floors fully soundproof, sound waves can still travel through your ceiling if it is not properly fortified, see figure to the left. 1) (Optional - Apply Green Glue with Strips of Drywall: For superior sound control, cut strips of drywall to fit in between the ceiling joists. Apply Green Glue on the strips and screw into the underside of the sub floor, sandwiching the green glue between the sub floor and drywall. You can double up by doing the same thing with another strip of drywall over the first. This step may be omitted if you are on a budget or if it involves too much labor for your project). 2) Apply Insulation: Install Fiberglass Batts in between your ceiling joists; be sure to put some on top of any recessed lighting that you may have. 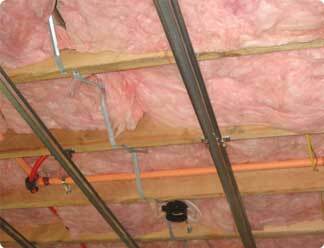 Tip: Keep recessed lights and HV/AC ducts to a minimum on ceilings that you are trying to soundproof. (We generally find that if the floor and ceiling are done as described, there should not be any major issues with the recessed lighting. However, for the perfectionist, or in a case when there is a lot of recessed lighting, they may need to be boxed around. Details will be discussed in a different article). Tip: Use flex duct, not rigid metal, for any ductwork running through your soundproofing projects. 3) Install Resilient Sound Clips on your ceiling joists. 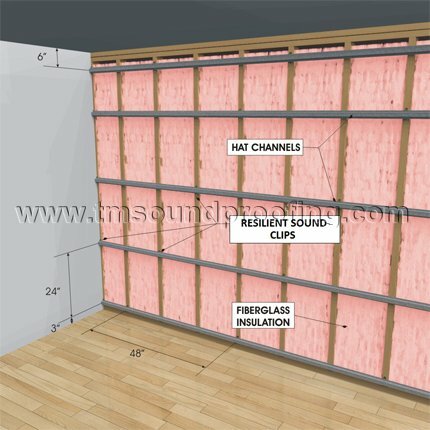 For detailed installation information, see our Resilient Sound Clip Installation Guide. 4) Apply Hat Channels: Run 7/8” Wide, .25” gauge Hat Channel through your clips, overlapping all ends by at least six inches and screwing together with self-drilling sheet metal screws. 5) Apply Drywall: Raise your drywall into place and screw into channels using recommended drywall screws. [Do not attach drywall to ceiling joists in any way as this will compromise the floating ceiling that you have created]. 6) Add Green Glue and Another Drywall: Apply Green Glue to the back of a 2nd sheet of drywall, using 2 tubes for every 4” x 8” sheet. Screw the 2nd sheet of drywall into channels using longer screws. (This step can be omitted if you are on a budget, especially if you have installed the Green Glue on the floor above). 7) Caulk: Caulk the perimeter (and the seams, if you only used 1 layer of drywall) using high quality Acoustical Caulk. Additionally, caulk the space between the recessed lighting and the drywall. 1) Add Insulation: Install fiberglass in between the studs (R-11 Insulation Batts for a 2x4" Framing and R-19 Insulation Batts for 2x6" Framing). 2) Install Resilient Sound Clips on the face of the studs using the following guide: Whisper Clips Installation Guide. 3) Follow Steps 4-7 in Ceilings (apply Hat Channels, apply Drywall, apply Green Glue, apply another layer of Drywall and Caulk) See images below. 4) Seal Electric Boxes: Make sure to seal around all electrical outlets and close up all holes. To easily sound seal electrical outlets, we recommend applying our STC Seal for Outlet and Electrical Boxes, which can be added after the drywall has been applied. (Acoustical Outlet Putty Pads can also be used, however these need to be added before drywall is installed). 5) Alternative: Another simple option is to install 2 layers of drywall with Green Glue directly onto the studs. Tip: We HIGHLY recommend treating the ceiling of the room the same way as the wall, due to high percentage of sound leaks over the walls thru the ceiling, as noted above. The obvious question that we are frequently asked is: Do I need the clips on the wall or is the green glue alone enough? The answer depends on what level of soundproofing you are looking to achieve, what type of noise you are trying to block, and if you have access to both sides of the wall. If the noise you are trying to control is standard talking, phone ringing, and some music, then you will have a tolerant level by using drywall and Green Glue, either by doing it on both sides of the wall, or by doubling up on one side. (Whenever possible, always try to soundproof the noise source side). However, if the noise is extremely loud or very low bass, like a loud home theater (where you can feel the vibrations), or you want the best soundproof wall available, then you should use the Whisper Clips and a double layer of drywall, with Green Glue on the other side or on the side of the clips. There are three main components to sound proofing a door: Mass, Damping and proper Sealing. 1) Mass: To add mass to your door, use flat panel, solid core doors and add a ½" Medium Density Fiberboard (MDF) panel to it. 2) Damping: Adding Green Glue Noiseproofing Compound between the MDF and door creates damping. 3) Sealing: Use Automatic Door Bottoms, Door Gaskets and other Soundproofing Door Hardware to firmly seal the gaps around the door. For more detailed info see our How to Soundproof a Door article. 1) Charles B, Architect: I need to provide STC 52 between apartments using 2x6 stud wall. Hi Charles, Resilient Sound Clips and Channels will get you into the 50's when used in conjunction with insulation. See our Whisper Clips here. Keep in mind that if you have an open air space above the wall you would have to treat the ceiling too. Thank You. 2) Charles B, Architect: I need to show proof of STC rating to the Building Department and the wall has to have a one hour rating. Hi Charles, See the Data sheet here showing the Orefield Lab test results. Please email us if you would like a copy of the actual test. We'll be glad to send it over. Trademark Soundproofing Reply: The Joist Gasket would help somewhat but not "considerably". Real decoupling requires the use of Resilient Sound Clips and Channel. You are correct that the adhesive glue will not add more than the adhesion of the tape. 6) paul: I am trying to soundproof a basement woodshop. I have a row house with brick party walls between neighbors. I read that decoupling and adding mass will help. Is the viscoelastic green glue recommended or is that more effective with low frequency noise? Your help is appreciated. Trademark Soundproofing Reply: Hi Paul, Green Glue Viscoelastic Damping Compound is very effective on all frequencies including low frequencies. It can be used in conjunction of Mass and decoupling. You will automatically have more mass when you add a 2nd layer of drywall however decoupling will require that you remove the existing wall and start from the studs. 7) Bill: When using resilient clips and channel, the detail is to caulk between the walls and the ceiling. Can you then tape and Sheetrock the joint or does tha defeat the sound damping properties ? Trademark Soundproofing Reply: Hi Bill, Yes, tape and joint compound will not compromise on the sound proofing done. 8) Vicki: Planning a 2nd story addition over existing master bed/bath. It MUST be completely separate and quiet. Now have a flat roof with zig zag trusses,4" rigid foam and IB membrane roofing. Will adding another separate flooring system over this, using the subfloor green glue/soundproofing mat and tape be enough? What about homeasote? Install under the subfloor? Hi Vicki. Adding a 2nd flooring system would help. 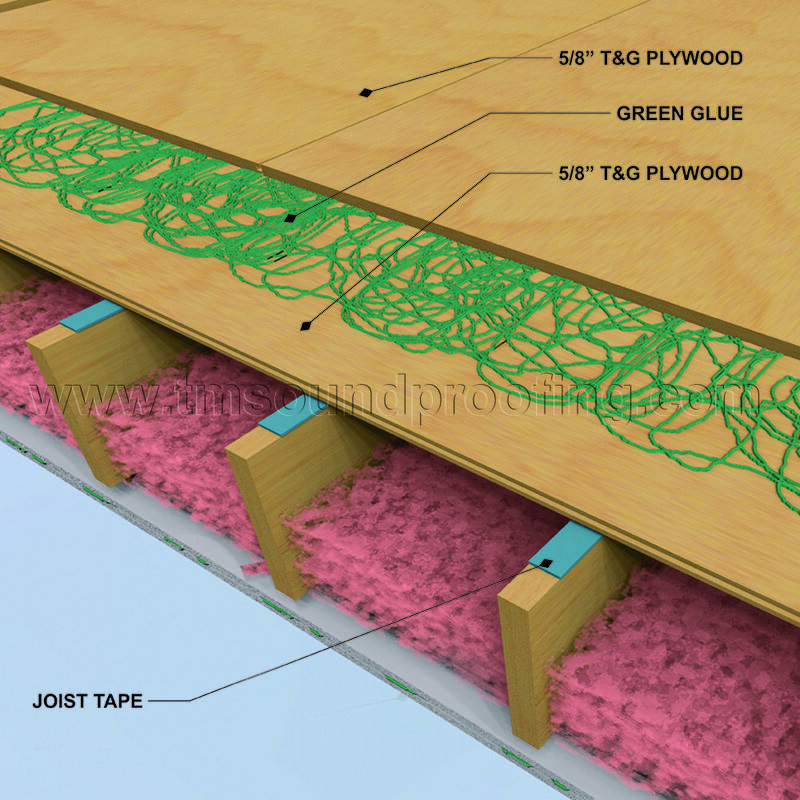 Best practice would be to apply joist gasket tape to the top of the new floor joists then 2 layers of half inch subfloor with the Green Glue Damping Compound between them. Fiberglass insulation between joists. We would also highly recommend that you decouple between the floors. This can be done by either redoing the existing ceiling with Resilient Sound Clips and channels or be installing the new floor joists onto rubber joist isolators. Thank You. 9) Robert T: Love the website. New two story light commercial construction question. Plan to follow the recommendation of gasket tape, subfloor, green glue, 2nd subfloor and finished floor with underpayment. For aesthetic reasons would like to NOT have an enclosed ceiling below, that is, I prefer to expose the underbelly of thre floor system and apply gapped wood planks (deco treatment) at bottom of the floor truss. Have considered coating the underneath of subfloor and truss with open cell foam before applying the wood slats. So questions are these - will the OC foam be as effective as sound batts, and can I survive the lack of drywalled ceiling, or will the loss be too great? Hi Robert, Thank You. Perfect way to do the floor. As a soundproofing company we do notrecommend an open ceiling plan. As you require some kind of decoupling and space between the floor and ceiling. As far as insulation goes fiberglass is better than spray foam for sound. If you have the room on the floor you can construct a decoupled floor using rubber joist isolators fill with insulation and then do the double plywood and Green Glue. Trademark Soundproofing Reply: Hi Robert 1) That is correct although the tape would still help to eliminate squeaking between the sub floor and floor joists.. 2) Somewhat better. 3)Not by a lot as acoustic panels are meant to control the acoustics in the room and not block sound from passing through. 11) Laverne: Hello, I have a separate suite in my basement and I want to soundproof the basement ceiling from sounds coming from the main floor above including voices, dog barking, and footsteps. I am going to follow the steps you mentioned however because of a tight budget, I only want to do the ceiling above the bedroom and living area. The bedroom and living room is separated by a hallway. I am wondering if soundproofing will be pointless if I don't do the hallway too? What do you think? Trademark Soundproofing Reply: Hi Laverne. It would depend in which direction the ceiling joists run. If you are lowering the ceiling using clips and channels it is less of an issue. 12) Nazar: Hi, I want to soundproof a room from noise of diesel generators. The sound level of the generators is not less than 110dBA. This room is being used as control room for these generators. What techniques and materials should be used for the purpose? Trademark Soundproofing Reply: Hi Nazar, We need more info on the construction of the walls and ceilings there. The general rules are still the same. Decouple walls and ceilings, add mass and damping. Trademark Soundproofing Reply: There would be if there is already insulation in the cavity behind the first wall. Trademark Soundproofing Reply: You would have to check with your insulation contractor. 16) joshua z: If 2 layers of subfloor are used with green glue between them, is screwing the second layer to the joists necessary? Won't the screws transfer vibration? Trademark Soundproofing Reply: Yes it is neccessary. Screws transfer vibration when you are trying to decouple and the screw short circuits the decoupling. With Green Glue you are damping the layer and the screws do not effect the damping . You should use acoustical caulk. 18) Mike: Hello, I'm building a drum studio with double walls, the draftman who has drawn up plans for this has said that the building needs to have a sheet of 2.4x1.2m plywood or gib inserted on each of the 4 corners of the building inside the wall cavity to meet building code and brace the building so it will stand up (because of the exterior cladding that I am using), my question is will this compromise the double wall system? Thanks for your time. Trademark Soundproofing Reply: Hi Mike. We would need more details to fully understand the construction. However if the plywood is attached to on wall only than you will not be compromising the double wall system. 19) Shane: After my ceiling is sound proofed with insulation and resilient clips. How do I fill in the gap between the ceiling and the wall. 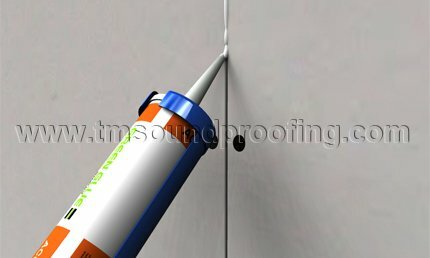 If I use acoustical caulk, can I still use joint tape and joint compound to over the acoustical caulk? Trademark Soundproofing Reply: Yes. No problem there. Just smooth the caulk down(with your finger) and then spackle and tape right over it. Hi Janet. No point in putting GG on the joists before installing the drywall. For height restrictions we have been getting excellent results by using insulation 2 layers of drywall with Green Glue onto the joists and the premium carpet underlayment with carpet on the upstairs floor. Correct. You can put drywall with GG in between the joists to the underside of the floor if you will not be using clips and channel. It will help somewhat, much better if you can do clips and channel. No point inputting Green Glue onto the face of the joists. If anything use the joist gasket tape. These are mainly used for the top of floor joists however we have builders that use them on walls and ceilings too and say that it helps. 22) Janet: Thanks for all your help. One more question, would it be okay to use 1/2" for the second layer or do I need to use 5/8's. Thanks in advance I really appreciate the advice. Trademark Soundproofing Reply: Half inch is fine. 23) Brian: I am working on a project in an existing commercial office building and there is existing carpet on the 1st floor slab on grade and on the existing 2nd floor slab on deck. The 2nd floor is supported by steel beams and metal open web floor joists. The documents called for the existing carpet to remain in most areas. The wall details call for sealant to be provided at the bottom of the drywall for acoustical reasons. The drawings do not specifically indicate that the existing carpet needs to be removed prior to the wall being installed. Therefore, the Architect is saying that the metal track cannot be installed over the existing carpet. Is there any details that you know of that provided me with support that the carpet should remain as it provide more acoustical value that removing it and installing the sealant? Please advise. Hi Brian. I don't know of any detail and technically if that is what the plans call for, the Architect has a good point. Carpet under the track is not a proper "acoustical seal" vs acoustical caulk which is. 24) jim: how to finish the outlets, switches, and door jam. if the soundproof wall is 2" - 3" out from the wall studs, that means the switch and outlet boxes will be recessed in the new wall. the door will be aligned with the studs of the original wall. how do you make the boxes and door flush / finished with the new wall surface? i am unable to find details on this anywhere. thanks, will you email me or do i have to look here for answer? Trademark Soundproofing Reply: Hi Jim. You can bring outlets boxes forward or get longer screws for the plate. For the door you can get what is called an "extension jamb". 25) Brad B: Your website is great. I am a Roofing Contractor and used to be a carpenter/finish carpenter, so my knowledge on "Correct" Soundprroofing just began a few months ago as i am finishing my own basement. So I have almost all my framing complete but in my media room I have many different ways to go on Insulation/Rc clips/hat channel/MLV/carpet pad, etc. etc. Forgive me if I don't use your exact products, but some of the prices are out of my range as I am over budget as I encountered an unexpected issue that had to be resolved (mold on above grade interior foundation wall!). So I've had many of my guys come over with their opinions and have formed my own, but after reading YOUR site, everyone else's opinions are out the window. My main concern is the open 16" o.c. Ceiling joists that i want to be total (or close) to sound proof. I was thinking of using a roofing product (and I'm really glad i found the words EPDM on your site. I have mentioned using this to many people with everyone looking at me like I didn't know what i was talking about...what if i ROXUL insulated first, spread and stapled the EPDM sheet taunt (i can get custom cut sizes at my roofing supplier) on the bottom of the ceiling joists for MASS, then used wood 2x3s tacked in a grid system on top of that (for another air space), then correctly spaced RSIC-1 clips, then double leg hat channel, then 1 layer 5/8 drywall...?? What are your thoughts? 1. Also can i "wrap" the whole room in EPDM sheet ? 2. Also there is 45 mil, 60 mil, and 90 mil thicknesses, what would you suggest? 3. I also Fire Foamed all around the electrical boxes, that ok? 4. Also was wondering if I can put the EPDM on the floor? It is an impermeable rubber-roid material, then carpet pad? 5. Also I already have my hat channel i found at a local big material provider. It measures 2 5/8. An 1/8 bigger than the max acceptance, im assuming this is ok...? 6. Also what are your thoughts on "closed cell" foam? I noticed a post above about open cell and was not recommended. I have to do this on my above grade foundation wall to prevent any future mold problems, but is just going on 1 of 4 walls of the room. Sorry for the long winded message. Hi Brad. Thank you and your forgiven . I am not familiar with the use of EPDM as it applies to soundproofing. In general it would depend on the weight. I would suggest that at least for the ceiling you should consider swapping out the EPDM for mass loaded vinyl. I would also simplfy your ceiling construction by eliminating the 2x3 grid system which will not add much as you will get the extra air space and proper decoupling with the RSIC-1 clips and hat channels. 1. You can do that again I don't know the sound ratings for this product. You may also want to check with an insulation contracrtor to make sure there are no moisture issues. 2. I would say that the thicker the better as this would be working by supplying mass. 4. See number 1 above. 5. If it fits into the clip than it is fine you may have some extra work getting it in there. 6. We do not recommend closed cell foam for sound proofing as it is extremely rigid. You want insulation to "absorb" sound waves. Hi Brad. The procedure that you mention will not give you anywhere close to the sound blocking vs using the RSIC-1 clips as you are not properly decoupling. There are slight differences between the 2 clips as far as UL ratings and method of installation. You would use the Green Glue damping compound, not the sealant. Why do you think you ran out of time? We have all the clips in stock and can ship them out same day and we offer the option of overnight shipping. Give us a call 845-388-1200. 27) Fernando L: Hi, I'm thinking about using Green Glue when we install the new floor in a currently gutted 90 year old house. Currently it has old plank subfloor. Can I apply Green Glue between plank subfloor and plywood? If that is not recommended, what would be the next thing least expensive way to do it? I'm thinking Green Glue between 2 OSB layers on top of the plank subfloor? Please let me know what you think. Many thanks! Fernando P.s. the information available on your website is awesome! Trademark Soundproofing Reply: Hi Fernando. As long as there are no large gaps in the planks and it is generally smooth you can do it. Otherwise use 2 layers. Thank you and we appreciate your feedback! 28) Billy M: I am building a sound proof recording studio in the out building/Oversize shed on my property. it is 14 x 14. the floor is currently hardwood in need of a new stain... I'll be sad to rip it up but I need it to be as sound proof as possible so the neighbors don't call the cops. the building has a cement foundation, your website shows in great detail how to sound proof a floor that is to a second floor.... what about ground level ? I keep reading about U-Boats ? Suggestions ? Trademark Soundproofing Reply: You should not have that much of an issue if it is a slab to ground floor as long as you treat the walls and ceiling properly. If you want you can add a layer of plywood/OSB with Green Glue in between to the existing floor and then finish the floor. Trademark Soundproofing Reply: Hi Rob, The cost of the GG will go down when buying multiple cases. Additionally the ten percent or more waste is of plain drywall only and of the expensive pre damped drywall. Thirdly you cannot get a 1 inch thick or even 5/8) pre damped drywall at that price. You are comparing a half inch thick which is 2 layers of 1/4". Therefore the 1 inch layer you are constructing with Green Glue will be far superior. Also when using your 2 layers you get to overlap the seams which eliminates sound leaking through the gaps. 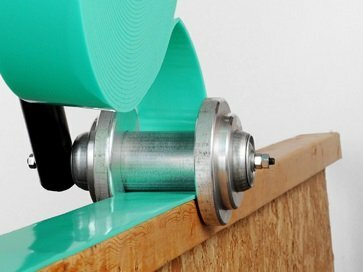 Finally, when using Green Glue you are also knowing that you are using the correct amount of material needed per sheet . Definitely use resilient sound clips and channel if possible, it will add a lot to the sound control performance of your ceiling. 30) Herman: Hi, I am building out my office and we have two types of stud walls - metal frame and wood frame. There are many shared walls (office to office, office to conference room, office to bathroom, etc...). 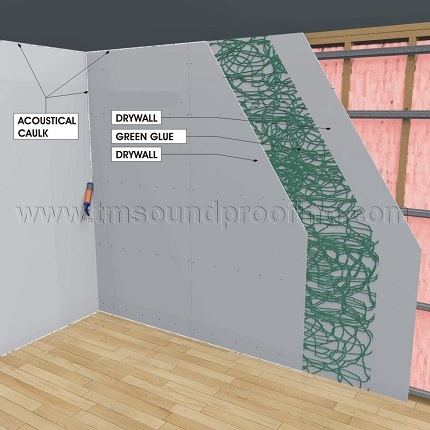 I am wondering if adding the insulation inside the metal frame walls and the whisperclips and green glue on the wood frame walls - both on single sheets of drywall would be sufficient for moderate office noise? There will be insulation above the floating ceiling. Thanks for all your help on this site! Hi Rob, You can use low profile resilient sound clips if ceiling height is a concern. For the high hats. Consider using LED surface mounted ones that only use a standard electrical box which you can cover with a putty pad. 32) Dalia: Newly built home. Master bedroom is very close to neighbor's driveway/basketball hoop. We can hear them playing and cannot sleep. Very deep vibrations. Would soundproofing our room prevent this outdoor disturbance? We have a tray ceiling, windows in master, unfinished basement under us, and master bathroom separated by a wall and sliding door. Help! Hi Dalia. Of course it would help, that is what soundproofing is meant for. 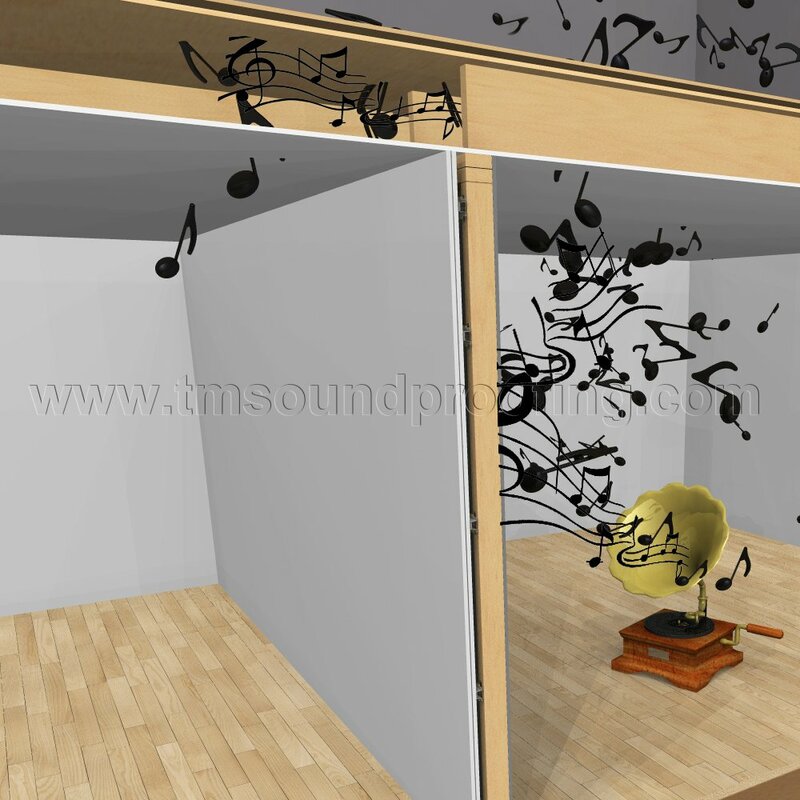 Problem is most people will not properly soundproof a newly constructed room which basically means redoing the entire room. You may want to start with your windows and see if that helps. See our Soundproof Window Panels. Always good to add some insulation however you are limited here due to the height of the sleepers. Try to get a fluffy insulation rather than a stiff board. A rubber underlayment will help with the footfall noise. 34) Barry S: HI, I'm building a new single-story home in the coming year (2018). The floorplan includes a 16x23x10 home theater, 19x14x10 music room and two smaller rooms (drum booth, vocal booth). I'm interested in soundproofing all of these. I plan to use whisper clips and 2 layers of drywall for walls and ceiling. I'm most curious about my floors--they will be installed on a concrete slab, with wood flooring. Would a rubber isolation be sufficient, or should I consider dropping the floor 4" and installing a floating floor? Thanks--great web site and products. Hi Barry. The floor on the slab does not need major treatment. You can consider using a double layer of subfloor with Green Glue in between to create a damped floor. Thank you. 35) Ashley: Looking to have an entire length of our old brick row house soundproofed. The current wall appears to be double brick and plaster. There are a few small settlement cracks along the plaster wall ? things would would expect to find in a 120 year old home. Our neighbours recently completed a renovation and it has become quite clear that there are serious noise flanking issues. In addition to addressing the noise flanking, we?d like to achieve a minimum STC 50, it?s likely around 30 right now ? we can clearly hear full conversations... A stud of wall if out of the question as our staircase is on the same wall. Which would provide a better STC rating; option 1: mass loaded vinyl and Sheetrock or option 2: green glue and quiet rock or Sheetrock? Would you recommend leaving the plaster on the walls, repairing cracks and adding mass on top? Or removing plaster down to brick and adding mass from there? Hoping you might be able to advise. Thank you kindly in advance! Trademark Soundproofing Reply: Option 2 would be better only if you will use 2 new layers of sheetrock with the Green Glue in between them. If you will only be using 1 layer of sheetrock than go with option 1. You can leave the plaster in place unless it will allow you to add insulation in the wall which is probably non existent now. 36) Joey R: Basement Ceiling, Rafters; 2 x 12's , 12" O.C., I only have 80" from floor to bottom of rafters. Planning to add dropped rafters ( @ 1/2" lower)between existing 2x12's to decouple new ceiling which will be double 5/8 drywall with Green Glue. Question is about insulating existing bays. Is it better to fill the bay completely or leave air space in the bay. Due to the fact that the bays are only 12" wide I will be cutting the batts to fit the width. My thoughts are that R-38 (12" tall) would better dampen the resonance of the 2x12's as opposed to something that is not as tall (R-13/19/30) for example. This will be a band practice room so I need to shoot for the highest STC rating possible with an emphasis on eliminating the lower frequencies ( 250 hz and below) to keep from rattling the China and Wine glasses off the shelves in the room above. Trademark Soundproofing Reply: As long as the insulation is fluffy and not compressed you can fill the entire cavity. Trademark Soundproofing Reply: Thank you. We have no testing on that however it adds some more mass, so it should improve the STC slightly. 38) Mike R: I am building a new house, trying to acoustically separate a family room on the second floor from an adjacent bedroom on the second floor. I have the opportunity to frame the floor such that the floor joists for the bedroom and family room are both supported by a common beam between them, but the joists themselves would not be continuous from one room to the other. Is there anything I could do with the joist-to-beam connections on either or both sides to help mitigate vibration transmission through the beam? You can connect the floor joists to the beam using a resilient sound clip like this one. However you should check with your engineer first to make sure that this is acceptable. You may be better off constructing the floor joists per the engineering plans and damping the floors by using a 2nd layer of plywood with Green Glue in between or constructing a floating floor using the joist isolaters and utilizing the sound control carpet underlayment if you will be having carpet in the room(s). 39) Larry: My customer has a bathroom on a common wall with a bedroom. He wants to remove the sheetrock in the bedroom, insulate with fiberglass, then cover the wall with 3/4 plywood, then 1/2" drywall on that. Space is not an issue. Would a new 2x4 wall spaced 1" away from the existing wall, with insulation and 1/2" sheetrock be more sound canceling than his plan? Trademark Soundproofing Reply: The new wall if fully decoupled from the first wall, will be more effective (if you have an open air space above the 2 walls you will need to soundproof the ceilings as well). 40) Richard S: I have a 3/4" subfloor with 1/2" insulation board and another 3/4" subfloor layer on the second floor. I will put a 12MM rubber underlayment on that and finish with a laminate floor. If I decouple the ceiling below this floor and do 2 layers of sheetrock with green glue will this be enough to stop the impact noise from above? Trademark Soundproofing Reply: If you decouple with resilient sound clips that will be a great ceiling/floor combination and the impact noise should be dramatically reduced. 41) Jeff: We are turning our basement into an in-law suite. The basement had an existing drywall ceiling which we have already removed. We found existing R-19 fiberglass batt insulation in the ceiling cavity. Should we replace that with a different type of insulation? Or should we leave it and add additional insulation like the fiberglass panels or rockwool insulation? Or are just the R-19 batts enough insulation and instead I should spend more money on decoupling? Thanks! Trademark Soundproofing Reply: R-19 is fine. Spend the extra effort and money on the decoupling and damping. Trademark Soundproofing Reply: Hi. 1 lb MLV is fine for your application. Definitely not overkill on the ceiling and if you are having an impact noise issue there you should consider using resilient sound clips and hat channel for the ceiling if you can afford to lose an inch of space. Trademark Soundproofing Reply: Hi Mark. Ceiling projection for clips and channel is an inch and 5/8. The commercial Whisper Clip is an inch and a half. The low profile clip is attached to the side of the joist however it works just as well as the others as the channel skims right below the joists and does not touch the joists. You would save about 5/8 of inch using those.